Many of us have had cramps before. Not to be confused with side stitches. Even though side stitches pose similar symptoms they are not cramps. Side stitches are usually caused by improper breathing, or overstretching your diaphragm. Those can easily be taken care of my putting pressure on the side stitch while regulating your breathing. As far as what causes muscle cramps, it is debatable. I always thought that a lack of sodium in the muscles, dehydration, heat, or poor nutrition was a cause of muscle cramps but according to some doctors, that has nothing to do with. (from Competitor Magazine) But there are no studies to show otherwise. I logged in over 600+ miles last year in training and dealt with almost everything possible. Cramps certainly was one of them and I found ways to keep them under control. 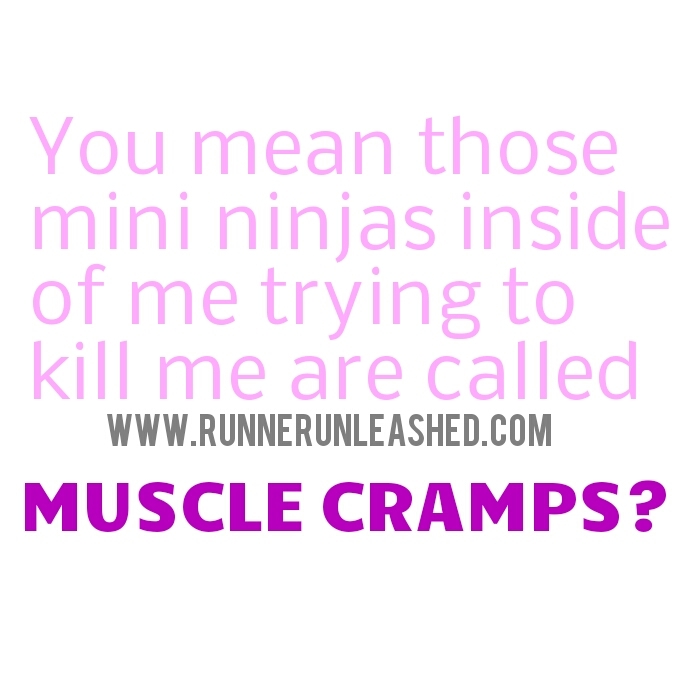 I was hit with my first charley horse, aka muscle cramp, at a local half marathon. I was feet from the finish line and my right calf was starting to buckle and tighten. I kept running because I was at the finish and once I crossed and stopped running…BAM! My calf completely locked up and had ridiculous pain! I sat on the floor and let the cramp just go, once I could walk on it I went to the ice tent and got iced. What actually happened to my muscles? It was a muscle spasms, involuntary contractions of muscles. It honestly did freak me out because I had never had pain like that in my leg. That was the first time and last time it has happened. My muscle looked like I had little ninjas jumping around. I also know that some meds cause muscle weakness, so if your on medication, check the side effects and make sure this won’t be a problem. (from WebMD) I was sick with a respiratory illness and was doing albuterol treatments and boy did that make my muscles weak! I didn’t even attempt to run because walking felt like a lot of strain on my legs. I know that getting a leg cramp is probably a runner’s worst nightmare! Am I right?!?!? So here are some things you can try to relieve the pain. STRETCH!! Honestly the most effective way to battle a muscle cramp is to stretch it. It inhibits muscle contraction. It eases the tension and has been known to stop the cramps. This is usually what I do when my cramps are acting up. MASSAGE. Can’t stretch it out? Try massaging the area with some deep massage and then gradually work up your speed again. ICING. It might be difficult to find a bag of ice in the middle of a trail, but if you do have access to ice, then icing your cramp can give some relief. Also using a heating pad can help relax the muscle. EPSOM SALT. I have run distances where I end up sore, feeling like I could cramp up. I usually sit in an Epsom salt bath after longer runs. I fill a tub and sit there for 20 minutes and it takes away all soreness and relieves the cramps. You can also soak a towel in Epsom salt and water, and just place the towel over the area. There is also an Epsom salt lotion you can try. I usually get my muscle cramps in my calf muscle. Unfortunately it comes with no warning, but I do run prepared. Whenever I run low distances I don’t have a problem. It’s when I run 10+ miles that my calf could start to get tired and feel sore. So I prevent the cramps by….you guessed it, wearing KT Tape! I have used this even since and sticks in all-weather conditions, including this Florida humidity! yuck! Getting muscle cramps is pretty common with runners, and you can take care of them yourself. But if you get them more often than not, you might want to check with your doctor about it. I think that the best way to fix a cramp is to stretch. You all know how I feel about stretching. I stretch every day whether I run or not. Sometimes you can feel a cramp coming on and you can just reduce your speed, catching it early will certainly prevent it. But if you do get the cramp and the pain is unbearable, then backing off completely and treating it might be your best option.Training at your target speed for the target distance will help strengthen your muscles and get them used to the work you put them through, thus reducing the cramps. I wouldn’t recommend running through the pain on this one. I know runners, including myself, are known to ignore some discomfort that we might experience, but with cramps, you can tear muscles and cause more damage. Taking a break, giving your muscles time to repair and recover will help. 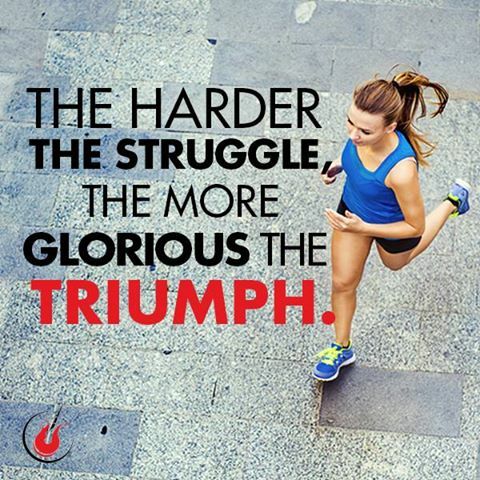 That’s why training for races is so long. It’s OK to take a day off to recover, you just try again the next day and so on. Your body will strengthen and toughen up and your cramps should be less frequent. Previous Previous post: BLING it! Next Next post: I shined, YOU shined, we ALL SHINED!